Peacing it all together, TMP uses an eclectic backdrop of afro-cuban-reggae influenced rhythms & a chorus of children led by Brett Dennen's velvetized voice, to entice you to enjoy insightful, contagious lyrics. Proceeds go to this nonprofit's programs. CHILDREN, PARENTS, AND EDUCATORS ALIKE ARE RAVING ABOUT OUR CD! THE MOSAIC PROJECT is a 501 (c)(3) nonprofit organization. All proceeds from CD sales go directly towards our programs. We work towards a peaceful future by uniting children of diverse backgrounds, addressing issues of difference, and building self-esteem and community in our unique human-relations outdoor school. The Mosaic Project Presents: Children Songs for Peace and a Better World highlights our unique musical curriculum including original songs about diversity, empathy, conflict resolution, and peace. Our positive messages are communicated in a poignant, respectful, fun way. "I still to this day have the songs in my head, over and over teaching me these important lessons." BRETT DENNEN is the musical genius behind this project. Visit his website, www.brettdennen.net for details about his own music for grown-ups. This young, redheaded troubadour is a very gifted songwriter and acoustic guitar master with a soulful blend of everything that feels good! He has an appeal that defies genres, genders and generations. Uplifting, positive and fun to listen to. Both of my kids love Brett's music. It is something that we can all sing along with. I am so glad that Brett is here to stay. Brett's voice and lyrics are inspiring for people of all ages. If there were a way to spread the emotions and perspectives presented in this music, the world would be a better place. I bought this for my future children and my niece to listen to. (She's five months old now, but it's never too early to embrace peace!) I love it! Why not support a great project like this??? Great job, Brett Dennen (and the kids on the album)! Yay for a peaceful future! cant wait for my son to hear it! 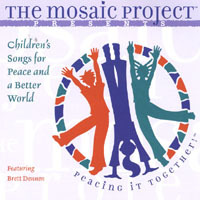 Having owned and listened to Brett's last two cd's, I knew before listening that the mosaic project would be excellent. My son is only three weeks old but I'll keep it around until he's old enough, and of course I'll keep it around for myself. My kids love it, great message and bopping music. What a talent. Gift for Daughter, she loves it!! Ok, I actually havent listened to it, but my 12 year old daughter heard the songs that they played them over and over at 6th grade camp this year so she copied and pasted the email and wanted it for christmas. I ordered it and she was really really happy. And shipping was super fast, 2 days so it was here in time for christmas. thanks so much! My class loves this CD. We especially love the Empathy Song. I ordered this CD because I had to do something for our school related to empathy. I needed a song that the kids (second graders)would love and could sing to the rest of the population(K-2)during a "morning meeting." My class loves the song and we are having a great time learning it as well as understanding what it means to be empathetic.THANKS!